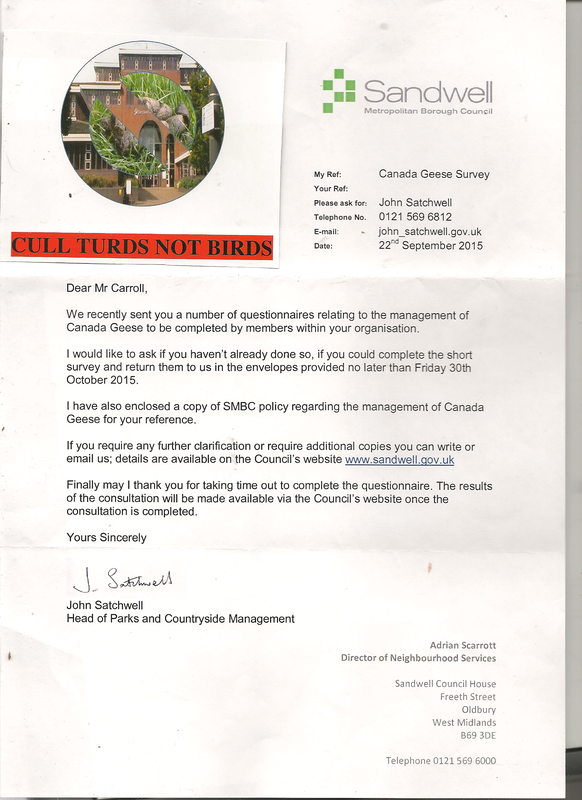 We are now in the midst of two things from looney Sandwell council and its obsession with exterminating geese from its two green flag parks, and be in no doubt that is their desired outcome of their green spaces staff and certain individuals who call themselves “friends” of these two particular areas. The first is an attempt to show that public opinion is on their side, which it is not, and the second to use an ambiguously worded but leadingly biased “questionnaire” as an instrument to achieve this. HAS ANYONE ACTUALLY BEEN GIVEN AN OPPORTUNITY TO COMPLETE ONE OF THESE INDIVIDUAL QUESTIONAIRES? THERE ARE CONCERNS THAT THEY HAVE BEEN GIVEN OUT TO CERTAIN PEOPLE WITHIN THE FRIENDS OF GROUPS TO OF COURSE TARGET CERTAIN PEOPLE WHO WILL FILL THEM IN, AND NOT ALLOW ANYONE WHO DOES NOT AGREE WITH THEIR CULLING POLICY THE OPPORTUNITY. 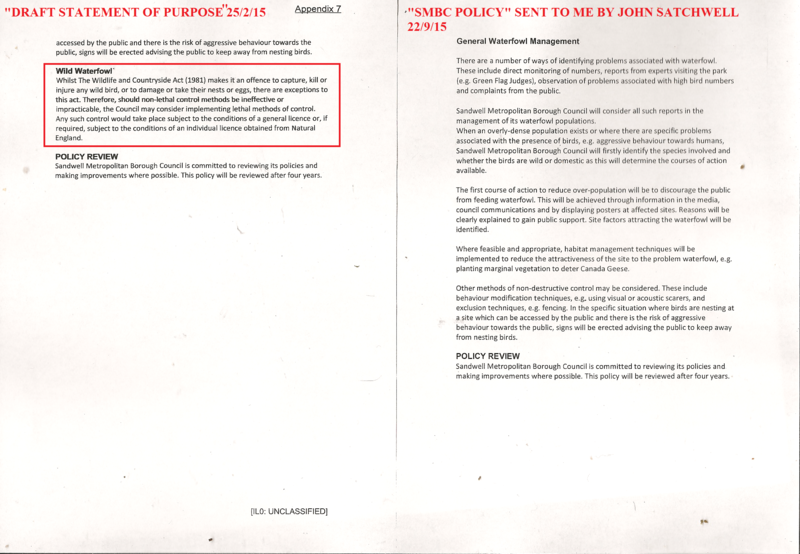 WHO IS UNDERTAKING THE DATA COLLATION OF THESE INDIVIDUAL QUESTIONNAIRES- IT SHOULD BE INDEPENDENT RESEARCHERS ONLY- NOT SANDWELL COUNCIL, AND NOT MEMBERS OF THE PUBLIC WHOM JOHN SATCHWELL CALLS “COLLEAGUES”. WHY HAS THE COUNCIL YET TO ADVERTISE THIS CONSULTATION PUBLICLY OR ON ITS OWN WEBSITE? We are still of course to learn of Sandwell council’s evidence base , of which it could offer none when our petition was presented at the so called “scrutiny meeting”. Over the Summer I awaited the consultation exercise of this document but it never came, none was ever put forward. I made phone calls to Adrian Scarrott’s secretary, who could offer me no advice on what had happened to this. Apparently he was to hold a meeting on with Maria Crompton in August but what came out of this is currently unclear. “Do you agree with SMBC policy on managing Canada goose populations? 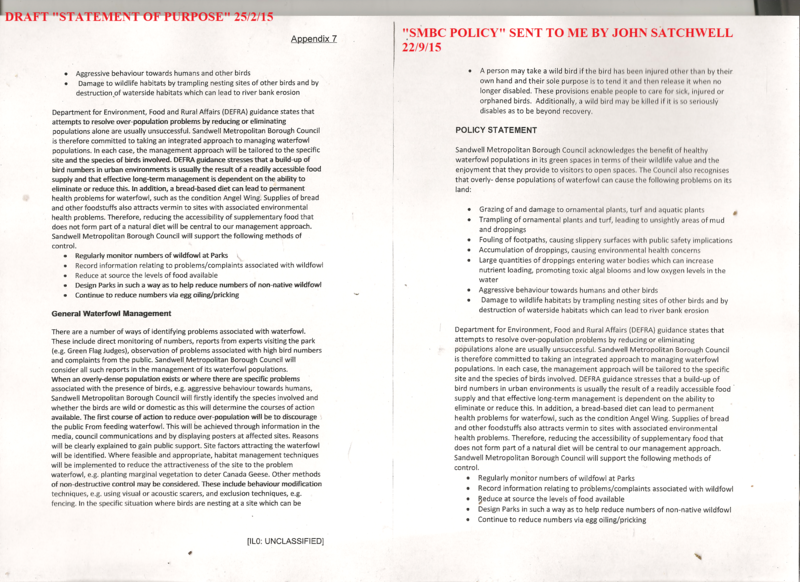 So imagine my surprise when receiving a letter from John Satchwell attaching a new “statement of purpose”, which he claims is now council policy. Well how did that happen? When was this approved and who by, at what meeting, where was the consultation that the scrutiny committee recommended for consultation? As consultation on this document never happened how can this be the current policy of the council, without it being formally ratified? Stranger still, the only change in what he is calling “council policy” is the omission of the offending penultimate paragraph talking about culling. So if a nameless person ratified this document then did they also dismiss this paragraph at the time, and where is the formal record of this at any meeting? The whole thing smells like crap to me, but it is the latest in a series of blunders, denials and deliberate misinformation emanating from the same council department, and it’s time someone went. The desired outcome no doubt is for those who oppose the cull to tick “yes” I agree with SMBC policy, yet I do not believe that this document is the council’s policy at all- for the lack of evidence of it ever being consulted upon, or formal process of it being ratified as policy. In his April 2013 culling report, the absence of the council’s formal policy is conspicuous by its absence- actually ratified in January 1997 at a formal meeting. 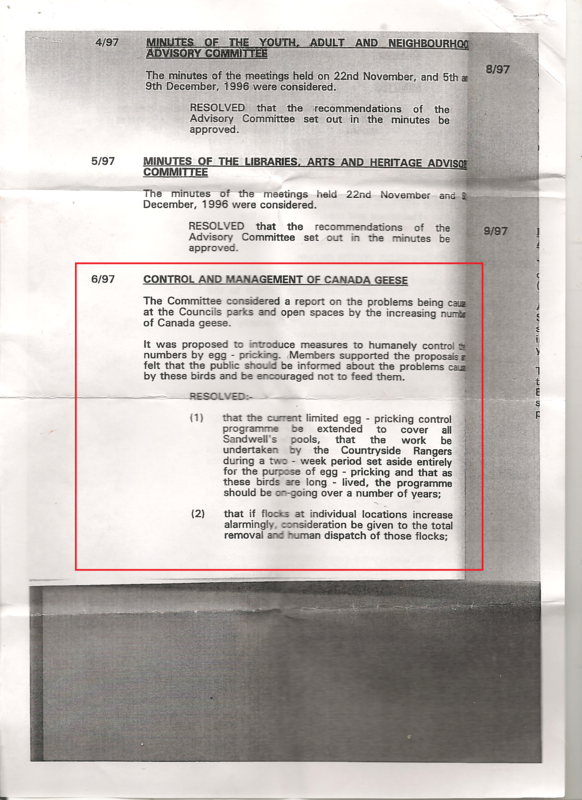 This stated that egg pricking would be undertaken by the countryside rangers, though we know that it didn’t. THIS AS FAR AS I AM CONCERNED IS THE COUNCIL’S BOROUGH WIDE POLICY. A new one for these two particular parks appears to be being formalised through subterfuge. 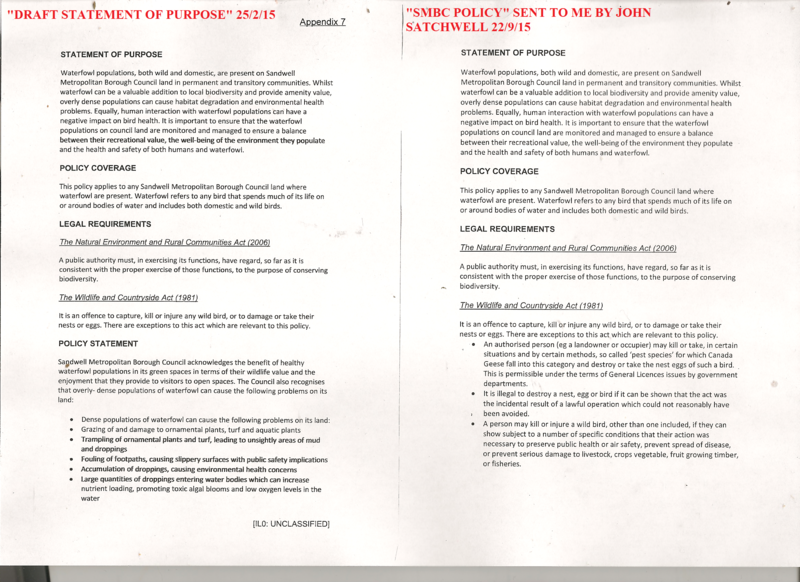 Below I have placed side by side the February drafted “draft statement of purpose” on the left together with what Mr Satchwell is now terming “council policy”- though there appears no record of it ever being approved. There are some slight changes as can be seen. CLEARLY ABSENT FROM THE NEW “POLICY” IS THE OFFENDING PARAGRAPH PREVIOUSLY STATED. ONE CAN ONLY WONDER IF THE COUNCIL ARE ONCE AGAIN DELIBERATLEY TRYING TO MISLEAD OR CONFUSE PEOPLE WITH THESE TACTICS. I HAVE IN CURRENTLY A FREEDOM OF INFORMATION REQUEST WHICH WILL HOPEFULLY CLEAR THIS UP- BUT I AM NOT HOLDING MY BREATH – WE ARE AFTER ALL TALKING ABOUT SANDWELL COUNCIL.